The new bike lanes replaced excess travel lanes on Harrison. Photos: Google Street View, Kevin Monahan. The Chicago Department of Transportation recently installed new buffered bike lanes on a 0.75-mile stretch of Harrison between Halsted and Loomis next to UIC and Little Italy as part of a water main project. Not only does the new bikeway extend the existing protected and buffered lanes on Harrison that run east from Halsted to Wabash in the Loop, it also represents a “road diet.” DNAinfo was the first to report on the new lanes. Formerly this stretch of Harrison was an overly wide four-lane street where speeding was common, but the new bike lanes replaced two of the travel lanes, a switch that is helping to calm traffic and shorten pedestrian crossing distances. “Previously, Harrison was very uncomfortable to bike on,” says UIC employee Kevin Monahan. There’s no street parking on this stretch of Harrison, so installing flexible posts on the buffer, to keep drivers from encroaching on the lanes, upgrading them from buffered to protected status, would have been a nice addition. However, CDOT says there are currently no plans to do so. “There are maintenance issues on Harrison and it’s not a very wide road,” said spokeswoman Sue Hofer. 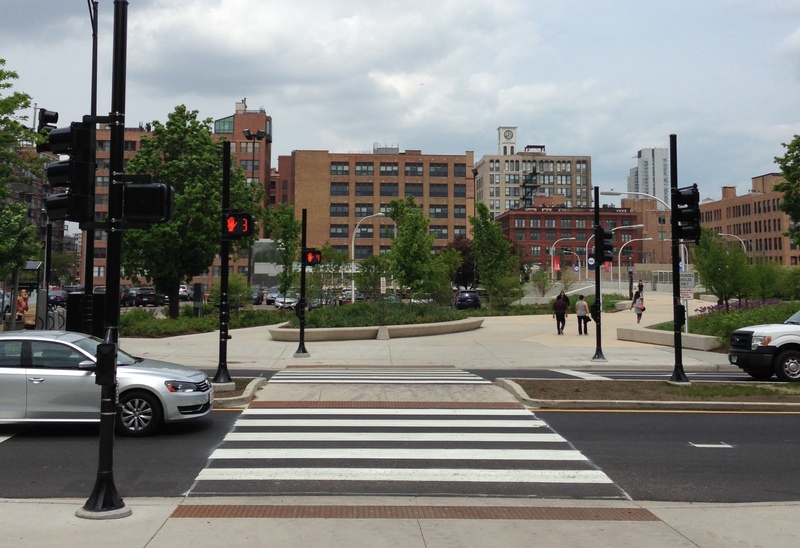 A pedestrian-activated (“beg button”) stoplight was also recently installed at a busy mid-block crosswalk a half block west of Halsted, between the university campus and walkways to the Blue Line’s UIC/Halsted stop. The area north of the crosswalk also received a landscaping overhaul. In addition, CDOT built a sidewalk bump-out on the west side of Racine near Harrison to discourage fast turns by drivers and shorten crossing distances, DNA reported. Is it Harrison or Halsted? I can’t keep up with which street you’re talking about. Every other sentence it seems to change. Grrrrrr why are they just buffered??? Needs concrete barriers anywhere where a bus doesn’t need to stop. I lived in those forms on Harrison. This is great to see a road diet. The City continues to have no backbone when it comes to PBLs. Harrison could be great E-W bike route from the Loop to Rush. Beg buttons are an insult to civilization. I don’t have a problem with them at mid-block pedestrian crossings, as long as they work. The 7 and 60 busses also run along this stretch. This isn’t a new problem with no solution. Look to the Netherlands and Copenhagen. I’m sure they have busses. They have bikes too. What do they do? Copy, Paste. I agree — hence my comment that it could be positive or negative depending upon how it’s done.